By collaborating with other organizations, ASPHO’s voice and impact are amplified. As I prepare these remarks, I sit at Camp John Marc in Morgan, TX, with the oncology teen campers on their weekend retreat. Last night, a 13-year-old shared his medical experiences with me, and my sense of our privilege was again rekindled. In her book Slow Medicine, Victoria Sweet talks about perspective and pace. Volunteering at oncology teen camp offers me the opportunity to see the importance of both, to see strength in our patients, and to reflect on our task at hand! ASPHO’s opportunity to interact and connect with peer organizations provides part of our contribution to the task at hand—to help you improve the health and well-being of children, adolescents, and young adults with blood disorders and cancers. The following are a few recent additions to a portfolio of our interactions with other societies. ASPHO and the American Society of Hematology (ASH) have agreed to collaborate on the Choosing Wisely project. Choosing Wisely is an initiative of the American Board of Internal Medicine (ABIM) Foundation to engage providers and patients in conversations about the overuse of tests and procedures. Individual lists provide tools and empower patients to ask questions about tests and procedures that might be best for them. The anticipated completion of a pediatric hematology list is the end of Q2 2019. ASPHO and the American Society of Clinical Oncology (ASCO) have established an expert panel to create pediatric oncology quality measures. This panel will develop and disseminate measures that may be used by institutions to enhance their work in quality and safety. ASPHO members in this panel include Amy Billett (Dana-Farber/Boston Children’s Cancer and Blood Disorders Center), Christopher Dandoy (Cincinnati Children’s Medical Center), Michael Link (Stanford University) and Amir Mian (Arkansas Children’s Hospital). ASPHO and the Sickle Cell Disease Coalition (SCDC) again promoted Sickle Cell Disease Awareness Month in September 2018. ASPHO along with many others knows the importance of raising awareness and finding a cure for Sickle Cell Disease. Appreciation goes to Robert (Shep) Nickel (Children’s National Health System and ASPHO liaison to SCDC), and the entire ASPHO Advocacy Committee for their continued efforts to keep this an important focus for our organization. ASPHO and the American Academy of Pediatrics’ Section on Hematology/Oncology (AAP SOHO) continue to review and recommend policies, guidelines, and other documents. Recently, this included an endorsement for a clinical report on Treatment of Iron Deficiency Anemia in Infants, Children and Adolescents. Appreciation goes to Eric Werner (Children’s Hospital of the King’s Daughters) and all of ASPHO’s liaison members to the review group. I will continue to highlight the work of this group in these periodicals. ASPHO’s continued attention to external relations and peer collaboration provides value to you—our members—and strengthens our Society. Copyright © 2018 by the American Society of Pediatric Hematology/Oncology. All rights reserved. The views and opinions expressed in the Special Feature articles are those of the author alone and do not imply an opinion on the part of ASPHO, its Board of Trustees or staff. The information in this newsletter is intended to provide readers with resources and information that they may find useful and of interest and is only current as of the publication date. ASPHO is not liable to any party as a result of their reliance on the information, recommendations, services, or resources discussed or made available through this newsletter. Registration opens soon for the 2019 ASPHO Review Course being held January 31-February 2, 2019, at the Omni Mandalay Hotel in Irving, TX. The Review Course is designed for physicians planning to take the American Board of Pediatrics (ABP) examination for initial certification in pediatric hematology/oncology and fellows in training and practitioners who wish to review the established standards of care in pediatric hematology/oncology. Offered every 2 years, the live course offers access to expert faculty, lectures that follow the new ABP content outline, a comprehensive electronic syllabus, and practice questions in electronic pdf format, and morphology slides in print format. Exclusive optional materials and savings are available to course attendees. The ASPHO Nominating Committee is soliciting nominations for candidates for two Board of Trustees-at-Large and two Nominating Committee members. Members are encouraged to nominate regular or international members who are in good standing and who can help lead ASPHO into the future based on the society's strategic plan and commitment to diversity The elected candidates will take office at the close of the 2019 Conference in New Orleans, LA. The nomination deadline is November 2. Learn more and nominate someone today! The dates are set for the 2018-2019 Webinar Series! The first webinar, Laboratory Evaluation of Primary Immunodeficiencies and Immune Dysregulation Syndromes, will be held on Wednesday, December 12, 2018, at 3 pm CT. Register today! Many new monogenetic immune defects are marked by autoimmunity, lymphoproliferation, and hyperinflammation rather than infectious complications. Hematology oncology physicians might be among the first to evaluate these patients. Practicing pediatric hematology-oncology physicians and trainees must have a greater foundation of knowledge regarding the laboratory evaluation of these unique and often complex patients. This webinar focuses on the best practices in laboratory evaluation of these immunological disorders, which is vital to ensure timely diagnosis and treatment for these patients and their families. We will look at mechanisms related to acute lymphocytic leukemia (ALL) treatment that increase risk factors during treatment and subsequently lead to long-term risk of cardiovascular disease, obesity and insulin resistance. We will discuss interventions that can alter the metabolic pathways to cardiometabolic disease. Describe the multifactorial physiologic mechanisms for obesity and cardiometabolic disease and discuss potential prevention strategies for pediatric ALL patients. Study the impact of obesity on childhood ALL survivors and long-term health-related outcomes into their adult years. Did you attend the ASPHO/COG CME Symposium: Recent Advances in the Understanding and Treatment of Pediatric CNS Malignancies? Complete your evaluation to receive continuing medical education credit for the symposium held on Thursday, October 4. Certificates will be distributed weekly via email. ASPHO invites you to encourage fellows and faculty members who are new to your institution to join the Society so they can benefit from important networking, education, and career resources. updates on key developments in the field. You may have noticed a few improvements to the My Account section of the website recently. Where you can track transactions, join and see your SIG communities, update demographics, and store evaluations, purchases and documents in this section. Individuals can even join SIG communities when they become a member, renew or register online! Now is a good time to check your Settings for email notifications for the Clinical Forum, SIGs and any other member communities you belong to. Make sure you are connected! There’s a new way to join SIGs! Current members now join SIGs by going to their My Account Special Interest Groups page. Stay in-the-know about your professional community. The Comings & Goings section allows members to share news of career changes in their position, department and institution. Senior Leader for Pediatric Oncology, Emily Couric Cancer Center, University of Virginia School of Medicine; formerly Associate Professor of Pediatrics, Adjunct Associate Professor, Oncological Sciences, University of Utah School of Medicine. Jodi Skiles, MD MS, beginning July 1, appointed Director, Stem Cell Transplant, Director, Fertility Preservation Services, Director, Pediatric Hem/Onc Fellowship Program, Dept of Pediatrics, Indiana University School of Medicine; formerly Stem Cell Transplant Physician, Dept of Pediatrics, Indiana University School of Medicine. Did you know that ASPHO is on Twitter? Join the conversation about developments and practice in pediatric hematology/oncology and follow us at @ASPHO_hq. Include ’@ASPHO_hq’ in your posts so your messages reach ASPHO’s followers. Samantha is a 16 month old Caucasian female seen by her pediatrician for 10 days of fever. Physical exam was notable for a palpable spleen. An ultrasound noted splenomegaly of 11cm. Her pediatrician was concerned after seeing this result and her screening CBC. She was therefore referred to Pediatric Hematology/Oncology. Get a start on your planning for the 2019 conference! Mark your calendar for May 1 - 4, 2019, and reserve your hotel room. 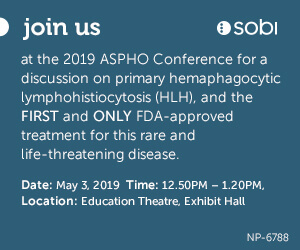 The ASPHO Conference Planning Committee invites the submission of abstracts for papers and posters to be presented at the 2019 ASPHO Conference. The call opens November 1, 2018. Abstracts must be original and include basic, clinical, or social science content that relates to the field of pediatric hematology/oncology. Submitted abstracts should focus on a topic such as hemostasis, thrombosis, vascular biology, case studies, red cells, hematology, leukemia solid tumors, bone marrow transplant, quality improvement, or outcomes research. The deadline to submit is January 8, 2019. The Young Investigator and Early Career Stipend Awards applications will open on November 1, 2018. Applications for the Young Investigator Awards will open November 1, 2018. Those who submit an abstract and meet the eligibility requirements may submit an application for one of two ASPHO Young Investigator Awards. The Young Investigator Award was established in 1989 to formally recognize excellence in clinical and basic science research in pediatric hematology/oncology. These awards will be presented at the 2019 ASPHO Conference. The deadline to apply is January 8, 2019. Fellows and recent fellows who submit an abstract to present at the 2019 ASPHO Conference also can apply for a travel stipend starting November 1, 2018. The Early Career Travel Award Stipend Award was created to provide funding for deserving young investigators to attend the ASPHO Conference to present their work and be introduced to the many benefits of ASPHO's education and networking programs. This award is based on evaluation of abstracts submitted for the conference. Five awards will be presented at the 2019 conference. The deadline to apply is January 8, 2019. Purchase your own online conference recording for everyday access to the education from the 2018 ASPHO Conference in Pittsburgh. This valuable reference compiles 49 hours of synchronized audio recordings and slides from 26 educational sessions, seven platform sessions, and five presentations by award recipients into one place you can easily access anytime. This information is relevant to pediatric hematology/oncology physicians, practitioners, and investigators as well as hospitalists, advanced-care providers, administrators, and other professionals in the field. The recording is available in an online streaming format. Viewers must have a high-speed Internet connection and speakers or headphones. Enjoy video highlights this year's conference in Pittsburgh! Grab your headphones and watch the video from ASPHO's conference in Pittsburgh. Relive the education and camaraderie of #ASPHO2018, where more than 1,100 specialists came together for education, science, and professional community. Visit ASPHO’s popular Career Center to stay on top of job openings in the field. The Career Center is the go-to source for employment and targeted recruitment opportunities in pediatric hematology/oncology.